Cannabis use has become a hot topic in several countries due to the debate about its legalization for medical purposes. However, data are limited regarding adverse events, safety and potential impact on reproductive health. Cannabis consumption during pregnancy has been associated with gestational disorders such as preterm birth, intrauterine growth restriction, low birth weight and increased risk of miscarriage, though the underlying biochemical mechanisms are still unknown. Given that the endocannabinoid system (ECS) is involved in several reproductive processes, we tested the hypothesis that the negative outcomes may result from the impact on the ECS homeostasis caused by the main psychoactive compound of cannabis, Δ9-tetrahydrocannabinol (THC). We demonstrate that THC (10–40 µM) impairs placental endocannabinoid system by disrupting the endocannabinoid anandamide (AEA) levels and the expression of AEA synthetic and degrading enzymes N-arachidonoylphosphatidylethanolamine-specific phospholipase D (NAPE-PLD) and fatty acid amide hydrolase (FAAH), respectively. Although, no alterations in cannabinoid receptors CB1 and CB2 expression were observed. Thus, long-term local AEA levels are associated with a shift in the enzymatic profile to re-establish ECS homeostasis. In chronic cannabis users, high AEA levels in placenta may disturb the delicate balance of trophoblast cells turnover leading to alterations in normal placental development and foetal growth. Nowadays, cannabis has become a hot topic in several countries due to the debate about its legalization for medical purposes. Although controlled trials are still necessary, preliminary studies have suggested that medical cannabis may be beneficial in some forms of pain and spasticity and for alleviating chemotherapy-induced nausea (Whiting et al. 2015; Maccarrone et al. 2017). The risks associated with cannabis use, particularly for sensitive population groups such as pregnant women, are difficult to assess as cannabis users are frequently tobacco smokers and it is difficult to separate these two habits in terms of their effect on pregnancy (Kuczkowski 2007; Coleman-Cowger et al. 2018). However, some population-based reports have described a direct correlation between cannabis consumption and negative pregnancy outcome (Fried 1995; El Marroun et al. 2009). Thus, studies in preclinical model systems are needed to produce mechanistic data on the maternal–foetal toxicity of cannabis. 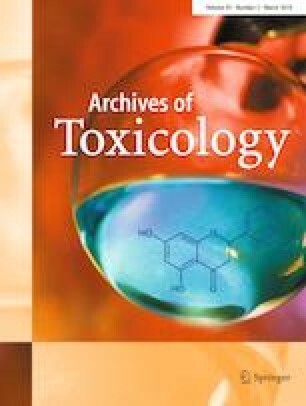 Although Cannabis sativa has been used for centuries, the main psychoactive compound Δ9-tetrahydrocannabinol (THC) was only isolated in 1963 (Gaoni and Mechoulam 1971) and its physiological targets, cannabinoid receptors CB1 (Matsuda et al. 1990) and CB2 (Munro et al. 1993) were discovered in the 90s. However, only recently has the CB1 crystallographic structure been resolved (Shao et al. 2016). After the discovery of these receptors, the first endogenous ligands, the endocannabinoids (eCBs) N-arachidonoylethanolamine, also known as anandamide (AEA) (Devane et al. 1992) and 2-arachidonoylglycerol (2-AG) were identified (Mechoulam et al. 1995). The eCBs, the enzymes responsible for their synthesis and degradation (Fonseca et al. 2013a, b) together with cannabinoid receptors, comprise the endocannabinoid system (ECS) that is involved in several physiological functions such as pain (Fine and Rosenfeld 2013), behaviour (Katona and Freund 2012), gastrointestinal (Di Marzo and Piscitelli 2011), immune (Cabral et al. 2015), cardiovascular (Montecucco and Di and Marzo 2012) and reproductive systems (Correa et al. 2016; Grimaldi et al. 2013). Endocannabinoids and endocannabinoid signalling in the reproductive tissues modulate fundamental gestational events (Fonseca et al. 2013a, b; Correa et al. 2016). In fact, the local tone of AEA needs to be tightly regulated for successful embryo implantation (Schmid et al. 1997). This is achieved through the balance between its synthesis and degradation enzymes, N-arachidonoylphosphatidylethanolamine-specific phospholipase D (NAPE-PLD) and fatty acid amide hydrolase (FAAH), respectively. When AEA levels are impaired, a miscarriage or ectopic pregnancy can occur (Maccarrone et al. 2000), (Wang et al. 2004). In addition, we have previously described the disruptive effects of AEA in decidualization (Almada et al. 2016), as well as in placental endocrine function (Costa et al. 2015a, b, c). The main phytocannabinoid, THC, due to its lipophilic nature, has the ability to cross the placenta (Grant et al. 2018). Clinical evidence has correlated cannabis consumption with low birth weight, prematurity, intrauterine growth restriction and perinatal death, though the mechanisms underlying these effects are still unknown (Park et al. 2004; Gunn et al. 2016; Metz et al. 2017). In addition, the neurodevelopmental data in humans and animals suggests a link between prenatal cannabis consumption and changes in some aspects of psychological well-being and higher-level cognition in school years (Grant et al. 2018). Cannabis is the leading drug of abuse in pregnant women, and due to its anti-emetic effects it is also inadvertently being used to ease morning sickness (Westfall et al. 2006; Dickson et al. 2018). This is a cause of concern, since cannabis consumption during pregnancy may negatively impact the foetus birth status and development either by the direct actions of THC or by a possible disruption on the endocannabinoid system homeostasis. Given this lack of knowledge and the importance of cannabinoid signalling for several reproductive events, the aim of the present study was to examine the effects exerted by THC on the ECS homeostasis, with regard to understanding the impact of THC in placental development and reproductive health. Human term placentae (38–40 weeks of gestation; n = 12) from Caucasian women who were non-users of cannabis with live singleton births, were obtained under informed consent. All the procedures concerning human placental handling were performed after approval of the Ethical Committee of Centro Materno Infantil do Norte, Centro Hospitalar do Porto, Portugal [Certificate number 321/13(189-DEFI/270-CES)]. Informed consent was obtained from all patients. After mechanical removal of the amniotic membranes and decidua, villous explants (30 mg) were prepared according to a previously described protocol (Brew et al. 2016) with the use of ammonium chloride (0.84% m/V) for the lysis of red blood cells. Villous explants were incubated with DMEM/F12 (Gibco/Invitrogen Corporation, CA, USA), containing 5% antibiotic/antimicotic solution (100 U/mL penicillin G, 100 µg/mL streptomycin, 0.25 µg/mL amphotericin B) and 10% charcoal-treated foetal bovine serum (FBS-CT) at 37 °C and 5% CO2 for 24 h to stabilize. Following stabilization, explants were changed to fresh medium containing different concentrations of THC (1, 10, 20 and 40 µM) and exposed from 24 h up to 72 h. At the end of the treatments, explants were collected and immediately frozen for RNA, protein isolation and AEA quantification or fixed for histological analyses. All methods were carried out according to relevant guidelines and regulations. To assure the placental explants’ viability, secretion of β-human chorionic gonadotropin (β-HCG) was evaluated, in conditioned culture medium by an enzyme-linked fluorescent assay (ELFA), MINI VIDAS® and VIDAS®hCG kit (bioMérieux SA, France), according to the manufacturer’s protocol. For morphological and immunohistochemical analysis, explants (n = 7) were fixed in 10% (v/v) buffered formalin at room temperature for 24 h. Samples were dehydrated through a graded series of alcohols, embedded in paraffin, before transverse sections of 4 µm were mounted on (3-aminopropyl) triethoxysilane (Sigma-Aldrich Company, Madrid, Spain)-coated slides. Hematoxylin and eosin staining (H&E) was employed to study general morphology. The cannabinoid receptors and AEA metabolic enzymes expression were analysed by immunohistochemistry using an avidin–biotin alkaline phosphatase complex, according to the manufacturer’s instructions (ABC method, Vector laboratories, Peterborough, UK). After dewaxing and rehydration, antigen recovery was performed with citrate buffer pH 6. After blocking of non-specific binding sites, slides were incubated overnight at 4 °C, with the primary antibodies against the ECS elements in the conditions described in Table 1. After washing, slides were incubated with diluted biotinylated secondary antibody for 30 min, followed by incubation with ABC-alkaline phosphatase reagent. The reaction was developed by incubation with Fast Red (Sigma-Aldrich Company Ltd., Madrid, Spain) and counterstained with Mayer’s hematoxylin solution (Sigma-Aldrich Company Ltd., Madrid, Spain) and mounted in aqueous mounting medium Aquatex (Merck, Darmstadt, Germany). Negative controls were prepared by substituting the primary antiserum with an isotype-matched non-immune IgG. Explant sections were analysed under a bright field microscope (Eclipse E400 Nikon, Japan) equipped with image analysis NIS-Elements Documentation software (Nikon, Japan). The explants (n = 12) for RT-PCR experiments were collected into RNAlater® (Sigma-Aldrich Company Ltd., Madrid, Spain) and stored at − 20 °C. Tissue samples from each treatment were submitted to homogenization with 500 µL of TRIsure reagent (Bioline, London, UK) using a pellet pestle. One microgram of RNA was reverse-transcribed using the GRS cDNA Synthesis Mastermix (Grisp, Portugal). cDNA was amplified with specific primers, using KAPA SYBR® FAST qPCR Master Mix 2 Kit (Kapa Biosystems, Woburn, MA, USA) in MiniOpticon Real-Time PCR Detection System (Bio-Rad Laboratories, USA), according to the manufacturer’s protocol. The PCR conditions were, in all cases, initiated with a denaturation step at 95 °C for 10 min, followed by up to 40 cycles of denaturation, annealing and primer extension. Primer sequences are listed in Table 2. The fold change in gene expression was calculated using the 2− ΔΔCt method (Livak and Schmittgen 2001) with the housekeeping genes, GAPDH and β-actin, though the presented data were calculated using GAPDH gene normalized to each control group. The individual explants (n = 12, 30 mg) were homogenized in 100 µL of homogenizing buffer (20 mM Tris pH 7.5, 150 mM NaCl, 1 mM EDTA, 1% Triton X-100), containing a cocktail of protease and phosphatase inhibitors (1:100 v/v), using pellet pestle followed by three cycles of sonication. After centrifugation at 700 g for 10 min, supernatants were collected and protein concentration was determined by the Bradford method. Briefly, samples (25 µg) were submitted to 10% SDS–PAGE and proteins were transferred onto nitrocellulose membranes in a turbo transfer system (Trans-Blot®, Bio-Rad, USA). Primary endocannabinoid system antibodies were incubated overnight at 4 °C in the conditions described in Table 1. Peroxidase-linked secondary antibodies were incubated for 1 h and the membranes were exposed to a chemiluminescence substrate (Advansta, CA, USA). Immunoreactive bands were visualized by ChemiDocTM Touch Imaging System (BioRad, Laboratories Melville, NY, USA). Membranes were then stripped and incubated with anti-β-actin (1:500; sc-47778) to control loading variation. Rat brain was used as positive control for CB1, NAPE-PLD and FAAH and rat spleen was used for CB2. AEA was quantified using liquid chromatography coupled to tandem mass spectrometry (UPLC-MS/MS) as described before (Zoerner et al. 2012). Shortly, explants (n = 12) were weighed and spiked with the 2 µL of internal standard AEA-d4 (2.8 µM; Cayman Chemicals, USA) and submitted to two cycles of 20 s with 5 s in-between homogenization with 1 g of zirconium beads and 500 µL of toluene performed in a Precellys 24 homogenizer (Bertin Technologies, France). The samples were then centrifuged at 5000 g for 5 min at 4 °C and the upper phase was collected and dried at constant nitrogen stream. The extract was then reconstituted in 100 µL of phase B (96% methanol (MeOH) (UPLC grade, VWR, Radnor, PA) and 4% ammonium acetate (AA) 2 mM) and transferred to an HPLC vial ready for UPLC-MS/MS analysis. Separation and quantification of the target analyte were performed using a liquid chromatography Acquity UPLC system was interfaced to a triple quadrupole mass selective detector Micromass Quattro micro API™ (Waters, Milford, MA, USA) using a Kinetex 2.6u C18 100A column (Phenomenex, CA, USA). The injection volume was set at 20 µL. The mobile phases were (A) 96% ammonium acetate (2 mM) in ultra-pure MilliQ water and 4% MeOH) and (B) 96% MeOH and 4% ammonium acetate (2 mM) in ultra-pure MilliQ water (UPLC grade, VWR, Radnor, PA). Gradient conditions were as follows: 0–5 min, 25 − 21% A; 5–11 min, 21 − 10% A; and then equilibrated at 25% A until 13 min. The flow rate was kept constant at 0.3 mL/min. Mass spectrometry analysis was performed with an electrospray ionization (ESI) source in the positive (ESI+) ion mode for all the analytes. Nitrogen was used as the desolvation gas (150 °C, flow rate of 350 L/h). The optimum mass spectrometry parameters were: capillary, 3.00 kV; extractor, 3 V; RF lens, 0 V; source temperature, 100 °C; desolvation temperature, 150 °C; desolvation; cone gas flow, 50.0 L/h; LM resolution, 13.0; ion energy, 1.0; entrance, 2; exit, 2; multiplier, 650. All analyses were done in multiple reactions monitoring mode. The UPLC-MS/MS settings and ESI source parameters were previously optimized by manual infusion of standards with a syringe pump and acquisition of the respective product ion spectrum after collision in the quadrupole. The transitions used for AEA and AEA-d4 were m/z 348 > 62 and m/z 352 > 66 (Zoerner et al. 2012). Six standards were used to perform the calibration curve, ranging from 0.5 to 50 nM. The lower limit of detection (LOD, defined as a signal-to-noise of 3:1) of the method was 0.15 nM. The limit of quantification (LOQ, which corresponds to the lowest concentration measured with acceptable accuracy and precision, relative standard deviation (%RSD) < 20%), was 0.5 nM. The data was collected using the software programme MassLynx4.1. All numerical data are expressed as mean ± SEM. Statistical analysis was performed using one-way ANOVA, followed by Bonferroni ad hoc post test to make pairwise comparisons of individual means (GraphPad PRISM version 6.0, GraphPad Software, Inc., San Diego, CA) when significance was indicated. Differences were considered to be statistically significant when p < 0.05. To evaluate the morphology of the villous explants, hematoxylin and eosin staining was performed after 24 and 72 h of culture. The syncytial layer was intact after 72 h of culture (Fig. 1a), demonstrating that our protocol did not peel this layer. This is a common event when aggressive treatments are applied to the explants, given the sensitivity of this type of cells. In addition, cytotrophoblasts, blood vessels and villous mesenchymal core also preserved their morphology. Moreover, to access the viability of the explants, β-hCG was quantified (Fig. 1b) showing that the villous explant sustained its endocrine activity. As displayed in Fig. 2a, immunohistochemical analysis demonstrated a syncytial location for CB1 and CB2, confirming the cellular pattern of expression described for term placental tissues. We then evaluated the impact of short-term (24 h) and long-term (72 h) exposure to different THC concentrations. The qRT-PCR results showed a lack of effect in CB1 and CB2 gene expression levels (Fig. 2b). Accordingly, Western blot analysis also showed that the treatments did not change the expression of cannabinoid receptors in placental explants (Fig. 2c). As observed for cannabinoid receptors, immunohistochemistry for NAPE-PLD and FAAH demonstrate that NAPE-PLD is located primarily in the syncytial layer (Fig. 3a), whereas FAAH expression was stronger in the connective tissue of the villous. In relation to mRNA levels, at 24 h, treatment with THC at 10 and 40 µM caused an increase in NAPE-PLD transcription and, contrariwise, a decrease in FAAH levels. Curiously, an opposite effect was verified at 72 h, as THC treatment induced a decrease in NAPE-PLD mRNA levels for all the studied concentrations, while FAAH levels were increased at 40 µM (Fig. 3b). Western blot revealed a similar pattern to the one observed in qRT-PCR: an increase in NAPE-PLD protein levels at 24 h accompanied by an apparent decrease in FAAH protein levels. When it comes to longer periods, at 72 h, the opposite effect is once again verified, with a significant decrease in NAPE-PLD expression and a rise in FAAH levels, though not statistically significant. The creation of a locally appropriate ‘anandamide tone’ is dependent on the tissue synthesis and degradation capacities. As short-term and long-term exposure to THC induced different expression patterns in AEA metabolic enzymes, we analysed AEA levels by UPLC-MS/MS. As seen in Fig. 4, AEA quantification demonstrated that THC has no effect on AEA levels at 24 h. However, after 72 h of THC treatment, all concentrations seem to induce an increase in AEA levels, although only a 40 µM treatment produced a significant increase. Endocannabinoids are lipid mediators involved in virtually all steps of human reproduction (Rapino et al. 2014; du Plessis et al. 2015). It is clearly established that the ECS plays a key role in implantation and decidualization (Fonseca et al. 2013a, b), although the function during placentation is not well-defined. In the placenta, the cytotrophoblasts (CTs) stem cells undergo tightly regulated cellular processes of proliferation, cell death and differentiation in which cannabinoid signalling is involved (Battista et al. 2015). Alterations in this complex trophoblast turnover can lead to pregnancy disorders like intrauterine growth restriction, preeclampsia, spontaneous abortion or miscarriage (Huppertz 2018). At the cellular and molecular level, several studies with THC in the µM range (up to 30 µM), which represents heavy cannabis consumption, have shown that THC directly interferes with CTs proliferation and gene transcription (Khare et al. 2006), migration and invasion (Chang et al. 2017), as well as angiogenesis in placentas of cannabis consumers (Chang et al. 2018). In addition, our group reported that THC impairs CTs differentiation into syncytiotrophoblasts (STs), an essential process for placenta development (Costa et al. 2015a, b, c). Moreover, a recent study demonstrated that THC might have negative effects on placental functions through the cannabinoid receptors, mainly in trophoblast migration and invasion (Chang et al. 2017). This study, even with a limited number of cannabis consumers, also reported alterations in placentae from cannabis users, with lower placental weights. In addition, similar studies in rat models have reported deficient angiogenesis (Chang et al. 2018) as well as a reduced number of foetuses (Chang et al. 2017). In humans, studies with high doses of intravenous THC suggest impairment of the ECS as increased plasmatic eCBs levels, followed by a decrease and return to homeostasis (Thieme et al. 2014). Although, the underlying mechanism was not reported. Given the scarce information about the mechanisms behind the adverse pregnancy outcomes in pregnant consumers, and the demonstrated influence of THC in eCBs plasmatic levels, we sought to investigate the effects of THC in placental ECS homeostasis. To our knowledge, our study is the first that evaluates the expression of several components of ECS after placental explants exposure to THC. Placental villous explants are described as a tool to test the chemical safety of compounds in placental functions including cellular uptake, production and release of hormones, growth, differentiation and pharmacological and toxicological processes (Miller et al. 2005; Brownbill et al. 2016). The tissue and syncytial layer sustained its integrity, as well as the endocrine ability as demonstrated by the histological features and β-hCG secretion (Audette et al. 2010). It is known that AEA tone at the implantation sites needs to be tightly regulated by its metabolic enzymes NAPE-PLD and FAAH for implantation (Fonseca et al. 2013a, b). These enzymes are also expressed in placenta (Park et al. 2003; Aban et al. 2013), possibly being essential to regulate AEA tone throughout placental development. When the short-term and the long-term impact of THC on AEA-metabolic enzyme expression and on AEA levels was examined, different outcomes were obtained. After 24 h of treatment, an increase in NAPE-PLD expression was observed, accompanied by a decrease in FAAH. In the same time span, AEA levels were relatively similar to the ones observed in the control groups. However, after 72 h, an increase in AEA levels was obtained with 40 µM of THC, supporting the expected increase in AEA production due to the high NAPE-PLD and low FAAH levels observed at 24 h. Therefore, the effects caused at 24 h at the enzyme level were only observed after 72 h on the lipid measurement. Due to its lipophilic nature, in the cytosol anandamide is shuttled through the cytoplasm to intracellularly localized FAAH for metabolism, through binding to fatty acid-binding proteins (FABPs) (Kaczocha et al. 2009; Fowler 2013; Maccarrone 2017; Di Scala et al. 2018). Since THC is also a ligand for FABPs (Elmes et al. 2015), even though with less affinity than AEA, its binding to FABPs may decrease AEA transporters availability, thereby reducing the rate of AEA intracellular hydrolysis, which results in an increase in its intracellular levels. This effect was also observed in a similar study with hepatocytes (McIntosh et al. 2018). In addition, these molecular transporters have already been reported in placenta (Duttaroy 2009). After 72 h of treatment, an opposite pattern of enzyme expression was displayed: an increase in FAAH and a decrease in NAPE-PLD. This suggests an attempt to regulate the abnormal amount of AEA by reversing the enzymatic profile shown at 24 h of treatment, producing the AEA main catabolic enzyme FAAH to reach ECS homeostasis. These results are in agreement with previous studies in rat brain that have pointed out that AEA levels could be modified after THC chronic treatment, where increased AEA formation was observed in the limbic forebrain (Di Marzo et al. 2000). Likewise, in humans, light users of THC showed higher cerebrospinal fluid AEA levels compared to heavy users (Morgan et al. 2013). Importantly, FAAH−/− mice exhibit normal CB1 receptor expression despite constitutively elevated levels of endogenous fatty acid amides. These findings suggest that elevated AEA levels may not affect acute CB1 receptor activity or regulation in response to chronic THC (Cravatt et al. 2001). Term placenta express cannabinoid receptors (Aban et al. 2013; Fugedi et al. 2014), therefore, we also examined the impact of THC in CB1 and CB2 by immunohistochemistry, qRT-PCR and Western blot. Results indicate that THC treatment does not alter cannabinoid receptor expression. Similar results were obtained by a comparable study with hepatocytes (McIntosh et al. 2018) and with the trophoblast cell lines, BeWo and HTR-8 (Chang et al. 2017). These observations do not match the decrease of both CB1 and CB2 reported by a study with placentas of mice treated with THC daily for 15 days (Chang et al. 2017), which may be due to the differences in the duration of treatment, as well as the use of different models. We verified that the long-term consequences of THC exposure in placental tissues induce alterations on AEA levels and modifications on the profile of gene expression of ECS components, namely on the AEA metabolic enzymes. These alterations vary according to short- and long-time THC exposure and the homeostasis recovery through the shift in AEA metabolic enzyme profile is time dependent. 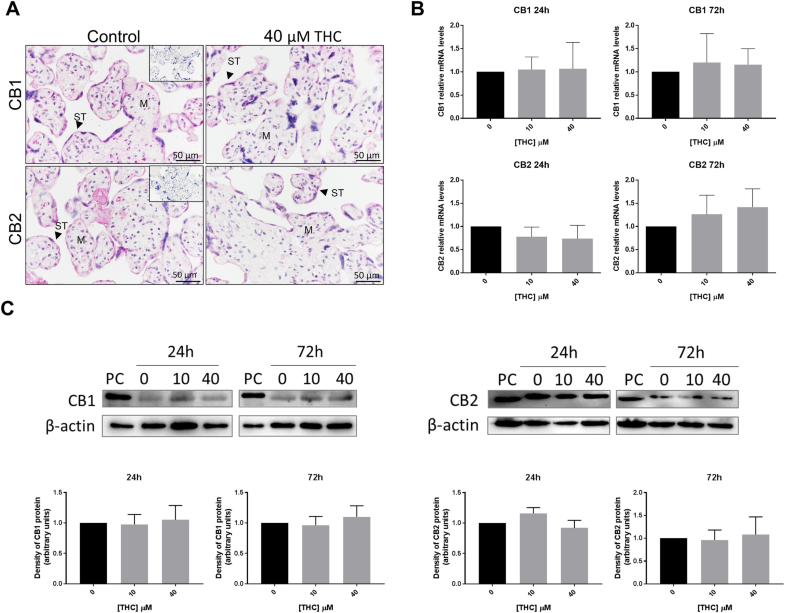 In chronic cannabis users, high AEA levels in placenta may disturb the delicate balance of trophoblast apoptosis (Costa et al. 2015a, b, c) and placenta hormone secretion (Costa et al. 2015a, b, c) leading to alterations in normal placental development and foetal growth. THC concentrations at which the effects were observed, are not typically achieved in plasma upon recreational use of cannabis. However, besides the drastic increase in THC content in plants in recent years, the pharmacokinetics of THC are complex and dependent on the route of administration and on individual factors such as metabolism and adiposity (Heuberger et al. 2015). THC is quickly eliminated from plasma, widely distributed to tissues and body fat serves as a long-term storage site. This particular pharmacokinetics explains the lack of correlation between THC blood levels and clinical effects (Liu and Martin 2018), being difficult to predict concentrations of THC in target organs. The results suggest that placenta exposure to THC is associated with temporal alterations in the endocannabinoid levels and ECS homeostasis. These short-term alterations maybe later overcome, therefore, replenishing the placental endocannabinoid system status. Although we have only studied the impact on the main cannabinoid receptors and on the major endocannabinoid AEA biochemistry, and not on related compounds, like 2-AG, OEA (N-oleoylethanolamine) or PEA (N-palmitoylethanolamine), our findings may be the missing link to the observed clinical negative outcomes in pregnant cannabis consumers. This work is financed by the FEDER Funds through the Operational Competitiveness Factors Program—COMPETE and by National Funds through FCT—Foundation for Science and Technology within the scope of the project “PTDC/DTP-FTO/5651/2014-POCI-01-0145-FEDER-016562”. Sara Cunha also acknowledges FCT for IF/01616/2015 contract. The authors thank Dr. Laura Pereira from the Clinical Analysis Laboratory of the Faculty of Pharmacy, Porto University for assistance with β-HCG measurements.